Berlin, Federal Chancellery, first floor. There they all hang, in oil, beautifully framed, side by side: the former German chancellors. 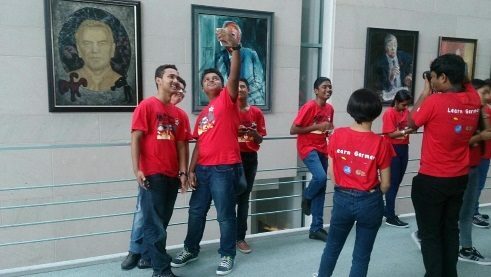 In front of them are about thirty Indian pupils, stretching their arms to take photos of themselves with the paintings. Their favourite selfie partner is Helmut Kohl; they are all familiar with him. Seflies with former German chancellors. 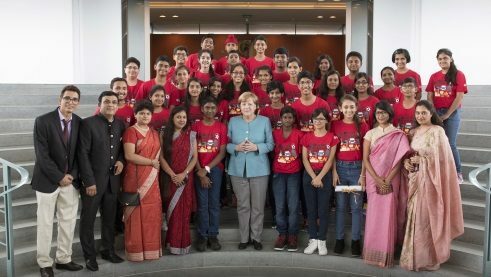 | Photo: Anja Martin The 31 pupils from all over India, between the ages of 12 and 15, won the Startup with German competition this year. They are learning the language as an elective subject at public and private schools and entered the contest by sending in creative videos, in German, of course. Their prize: A three-week stay in Germany, including language lessons and a supporting programme ranging from the Frauenkirche to the Blue Man Group. Also Startup with German chose India’s best teachers of German in 2017 in four categories and rewarded them with a language course at the Goethe-Institut in Berlin. They, too, are here today. And that is no coincidence, because all this came about because the German chancellor won the Indira Gandhi Prize in 2013 and wanted to give the prize money back to India. The Goethe-Institut was successful with its competition idea and found other partners: the Central Agency for German Schools Abroad (ZfA), the Indo German Teachers Association (InDaF) and the German Academic Exchange Service (DAAD). The pupils have been in Germany for a week now. When asked what has impressed them so far, 14-year-old Gursimar replies, “There are so many cyclists. And the Ampelmännchen!” She not only means the jolly figures, but the fact that there are pedestrian lights at all. “That everyone is so friendly,” says Divya from Pune. Gursimar reports about how a woman in Dresden bought one of the pupils an ice cream because they had no money with them. Somehow they like everything here: the clean cities and the street festivals, the churches and the architecture, Leipzig, Berlin, football, cars, waste separation. Visit with the Chancellor | Photo: Bundesregierung/Guido Bergmann Now everything happens very quickly. The group takes the lift to the Sky Lobby, half a floor above the Chancellor’s office. They have never been so close to world politics before. Then Angela Merkel arrives, asks them a few questions, and joins them for the photo. Thank yous are said and gifts presented and then she’s gone again. “I’ll never forget that all my life,” says a girl, obviously moved. Only one of them takes away more than the memory: Kuntak has managed to get an autograph. Outside the Chancellery, they all surround him and photograph the signature. Merkel may be the hero of their journey, but Kuntak is the hero of the day.